There are so many things wrong with the proposed Monrovia Town Center. And many of them will affect county residents and taxpayers, even if they do not live in the area. 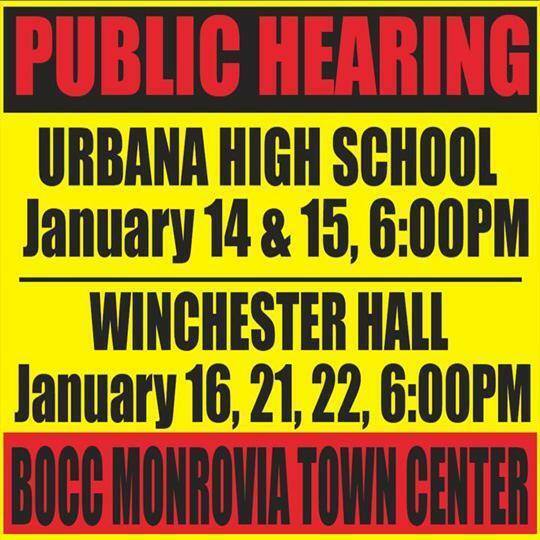 The Frederick County Board of County Commissioners begin their public hearings on the massive development this Tuesday night (January 14th at Urbana High School). This is your best chance to tell the commissioners – in your own words and in your own way – why you think this development is a bad idea. 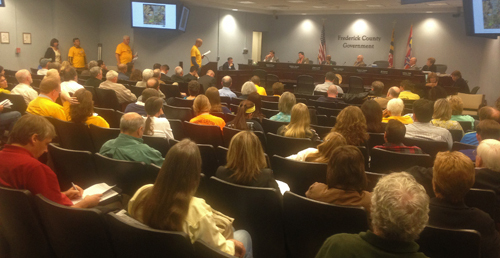 Speaker sign-up begins at 5:00 pm and the public hearing begins at 6:00 pm. PLEASE NOTE: The commissioners have said that people MUST sign up on Tuesday the 14th in order to testify at any of the planned hearings (which will be extended to additional evenings if the number of speakers makes it necessary). So why do we oppose the development? Let’s start with a few compelling financial reasons. The commissioners and the developer continue to tout how much the developer will contribute toward the necessary infrastructure – for schools and roads especially. But there are serious problems with that plan! (1) The proposed contributions from the developer don’t come close to covering the real costs! (3) In a separate, but related process, the commissioners are also working to eliminate one of the main fees the developer is currently required to pay to mitigate their impact on area schools. Let’s start with “not enough” for schools. Under the old system – before the Blaine Young led board gutted the county’s Adequate Public Facilities Ordinance (APFO) – if a proposed development failed the school adequacy test, the developer either had to expand or build to meet the need generated by the new development, or wait until the capacity was adequate (perhaps through new county-funded school construction). That wasn’t a perfect system – but it worked pretty well to avoid or reduce serious overcrowding. But now, under the Young board, the developer only has to write a check for the amount of school capacity needed for the development. Under this “pay-go” system, there is no guarantee when, or if, the schools are built. More importantly, under the new laws enacted by the current commissioners, and the separate, long term agreement the developer has drafted, the money the developer would be required to pay simply does not add up! It isn’t even close. For the Monrovia Town Center, the total of the developer’s school construction funds will be at least $5,000,000.00 short of the cost of providing the necessary new capacity. As long as the new — and current — system is in place, developers in Frederick County will be systematically under-funding needed school capacity, at the expense of county taxpayers. That’s the situation we would start with, but it would only get worse from there if these commissioners have their way. They have made it clear that they’d like to eliminate the county’s impact fees altogether. For the Monrovia Town Center alone, that’s over $20,000,000.00 (or 60%) of their projected contribution to the necessary school construction costs. Think about that. Even if the developer signs the developer-drafted Development Rights & Responsibilities Agreement (DRRA), which would include their legal commitment to pay the county’s impact fees (for necessary school expansion or construction), if the county eliminates the impact fees, the “binding contract” will no longer require the developer to make that contribution. Obviously, since the need would not be eliminated with the fees, the additional cost would simply be borne by current county residents. In essence, it would be yet another instance of a development-related cost being transferred to taxpayers, no matter where they live in the county. In addition, although Commissioner Young touts the developer’s projected contribution to road improvements in the area, the $7,000,000.00 they would pay toward Route 75 is only a tiny fraction of the estimated $262,000,000.00 cost of those projects. The estimated cost of bringing the area’s roads up to a standard that is adequate for public safety and to avoid massive congestion is very high because this is the wrong development in the wrong place. 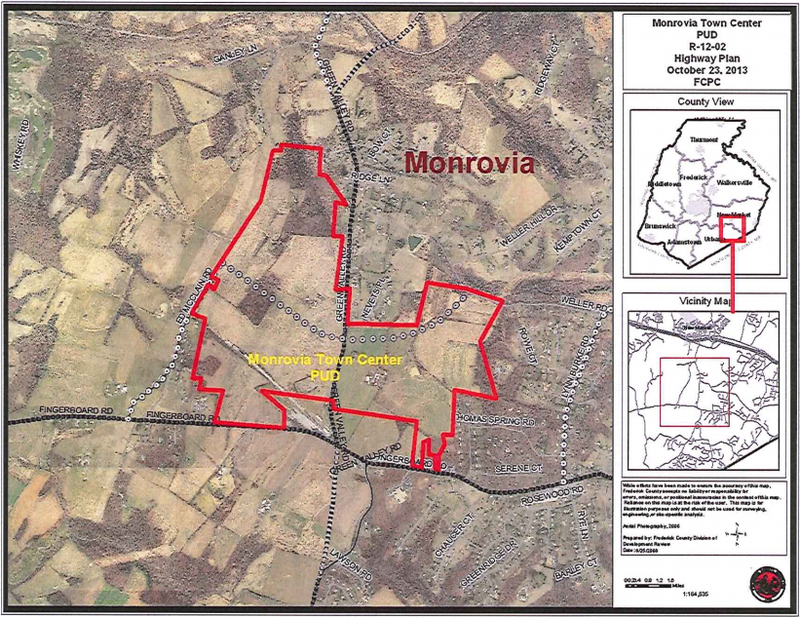 The massive development is planned for the middle of a rural area that is comprised of productive agricultural areas, wooded stream valleys and scattered, low density communities, which are served by narrow and winding two lane roads (mostly with no shoulders), a few miles from either Interstate 70 or 270. When you add the contributions from the Landsdale and Linganore developments (which will be adding thousands of additional vehicle trips through the area every day), the county will still only receive $11,500,000.00 toward the road improvements. Under the Development Rights & Responsibilities Agreement, the commissioners are hoping to lock-in the county to the development that will create the need for this road improvement, while guaranteeing the developers that they won’t have to pay for more than a fraction of it. What is their “plan” for getting the necessary road improvements? I asked Commissioner Young about that during my recent interview on WFMD (January 9th). Incredibly, the only response he could offer was that he would lobby our state delegation for more state funding. Even if some of that funding was available (and it isn’t), one has to wonder if the commissioner thinks it should be funded before the already very long list of already long overdue and extremely expensive projects that county residents and businesses are waiting for in the county? No matter how you look at it, we are guaranteed to have a huge and expensive mess with this development. And yet, we are supposed to believe, once again, that all the inevitable problems and costs will somehow be resolved…later. With this irresponsible approach, if Route 75 is ever “fixed,” we can be sure it will be decades away! Please come to the hearing this Tuesday night. 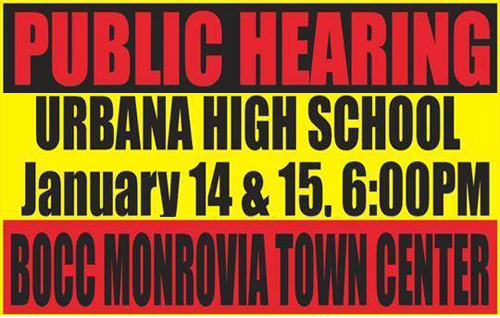 Tell our commissioners that you don’t want the Monrovia Town Center, especially with the proposed Development Rights & Responsibilities Agreement. Tell them you care … and tell them you vote! !